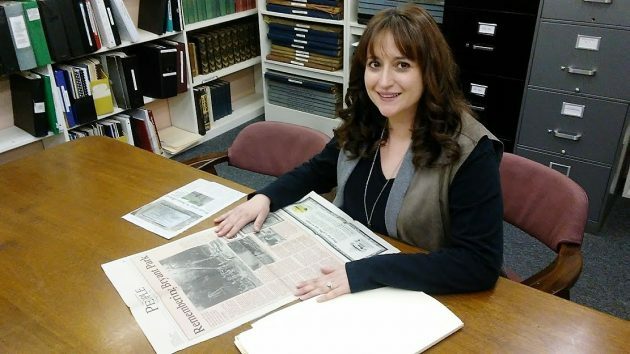 The archives of the Albany Regional Museum yielded these articles about Bryant Park. Staff member Erica Broad dug them out. 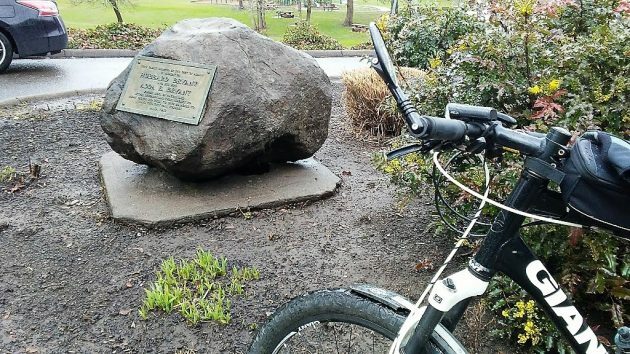 This is a story about how one thing leads to another, among them the spelling of the name of a park, a big anniversary, and the fount of local history that is the Albany Regional Museum. It began with a comment by Steve Lundeberg, a colleague when we both worked at the Democrat-Herald. On Feb. 4, Steve remarked on this site, in response to a story about the spelling of Lyon Street, that he used to hear people call Bryant Park “Bryant’s Park” instead. That reminded me of a plaque I had seen on the Third Avenue bridge across the Calapooia River. Here’s that plaque, and as you can see, the added “s” was part of the name as late as 1960. You will be struck by the absence of an apostrophe. 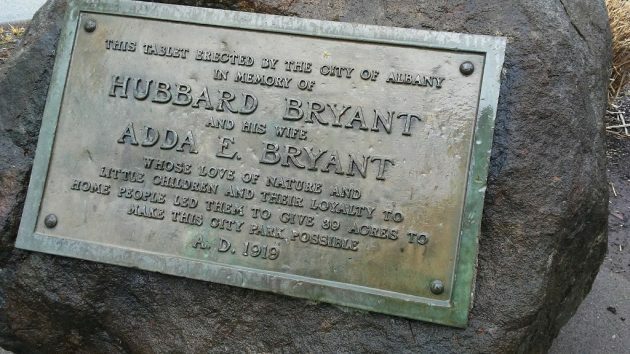 Which might make sense if you assume the plaque writers wanted us to remember that the park for which the bridge was named was donated to the city of Albany not by one Bryant but by two, husband and wife, Hubbard and Adda Bryant. It’s a touching inscription, I thought. And I could not help but notice that it commemorates a wonderful gift to the “home people” that is now one century old. But the phrasing left me unsure whether 1919 was the year the park was donated or the year the plaque was placed in the donors’ memory. That sent me to the Albany Regional Museum, where I asked Erica Broad, the museum’s coordinator of visitor and member services, what they had on the history of Bryant Park. In no time at all, she unearthed a folder with material on parks. And in it, there were two stories from the Democrat-Herald. The other story in the museum’s archives was also from the Democrat-Herald, written by Cathy Ingalls in August 1996. Cathy covered city government for a long time before retiring a few years ago and now volunteers as a museum board member and writer. This piece, on what we used to call the “People” page, was prompted by the construction in June 1996 of a floating bridge across the Calapooia. This triggered, in various longtime Albany residents, memories of a pontoon bridge they used to cross as children to get to a fabled swimming hole. The 1996 bridge was destroyed in the flooding of the following winter, and new restrictions intended to protect threatened fish runs have stymied any thoughts of replacing it since. Hard to see how a floating summertime footbridge that can be rolled up every winter could hurt any fish, so maybe cost and bother are the real reasons why the parks department has not pursued this idea. Cathy’s story called attention to another restriction Hubbard and Adda Bryant placed on their donation. No baseball or other athletic event was to be “tolerated” in the park on Sundays. 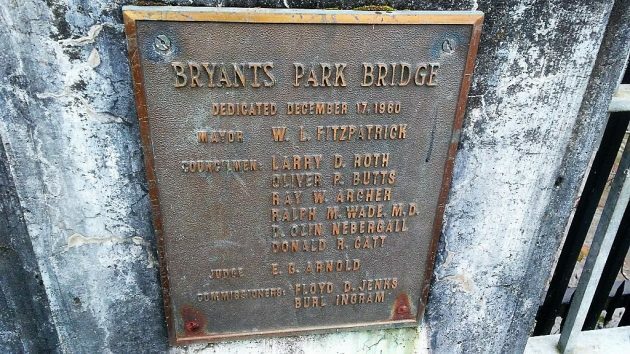 She also reported that the place used to be called Bryant’s Park but that the possessive was dropped in the 1960s. Obviously this was after the city’s leaders dedicated the bridge in the first year of that memorable decade. The big item for me was this nugget in the story: According to city records, it was on May 14, 1919, that the Bryants deeded the land for the park named after them. Well researched and great story. Thanks for the history lesson. I’ve always had to explain that I’m not related or can’t take credit (although I did have to take a new selfie at the sign when I was back in town earlier this year ). I personally think something should be done in celebration of a century. A second thought would be an annual celebration at the park titled Bryant days. Research may show something they enjoyed as to possibly establish a theme. Thanks for a great piece. I have many fond memories about Bryants Park. I’m marking May 14 in my calendar to make a visit to that great old park! Having been around for more than half that Century, I have very fond memories of what I have called my whole life Bryants Park. My favorites are as a kid doing parks and rec activities. It was a great place to go before the tweaker/homeless scourge. But this is what you get when you have a society that has no rules and accepts the ridiculous. Jason is on to something. He harkens for another time. When persons of one race bought and sold persons of another race. When a person could be jailed because that person loved another person in a way not approved by certain religious persuasions. When a respected priest was allowed to destroy countless young lives because no one would take the word of a child against that of a Man of God. Yes, we should attempt to recover those glorious times. Sign me up! Great read HH, Lived here all my life and did not know the history. Well done, Hasso. Very interesting. However, somehow parks and rec has found a away around the Sunday pastime restriction … or maybe slow-pitch city-league softball doesn’t count as an athletic event? Thought that interesting also, they respect one of thier wishes but not the other? Turns out that the restriction on Sunday ballgames does not exist, at least not in the 1919 deed. When I looked up the actual deed on March 5, it showed the liquor ban, but there is no mention of baseball or other athletic events at all. The story has been told, the property was donated with another stipulation. A bridge was to be built, able to support the crossing of fire department trucks. I am unaware of how many motor vehicle bridges have spanned the calapooia there, but I’m guessing more than one prior to 1960? There is quite some difference in years between the deed donation and the building of what currently stands from 1960. Any thoughts based on your research? For me, the big item of interest and inspiration is the quote at the end of the article credited to Bryant: “I think it is the duty of every man who makes money in town to leave something for that town….and I am willing to show by my actions that I believe that way.” Albany residents are fortunate to benefit by this sentiment carried out over the years by the Bryants and many others. The Albany Regional Museum is a great place to find the stories behind such treasures.